When you go about choosing a roof for you home, there are many options to consider. Though you may have an aesthetic preference, it’s important to be educated on other aspects, such as functionality and durability. Each material type has pros and cons and should be chosen based on what overall goals you have for your the roof of your home. 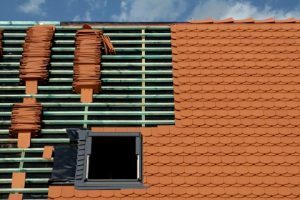 So before you go all out and make your final decision, let’s take a look at some different options for roofing and what benefits they could offer. A common choice for a more upscale home, slate is sleek and offers great visual appeal. Even though it tends to be a more expensive choice, slate roofing allows you to be a bit more personal in your layout and design. There is a wide selection of color, shape, size, and overall the design in which they are laid. 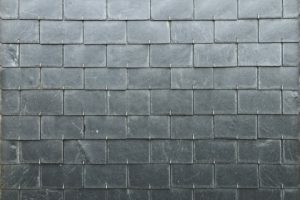 Some of the benefits of slate include: natural in appearance, low maintenance, very durable, longevity, and it is fire safe. However, there are a few cons to slate, such as: fragility when being walked on if there is a need to go on the roof, on the heavier side which means more support is needed, and it can make painting very difficult. One of the most popular types of roofing material is asphalt shingles. Made from a combination of backing, mineral granules, and asphalt, shingles are easy to work with. Some of the pros of choosing asphalt shingles are: usually very affordable, low maintenance, a wide variety of product choices including color and styles, and a class A fire rating (if they are fiberglass-backed), just to name a few. On the other hand, if where you live is extremely hot or windy, you may want to reconsider this option. 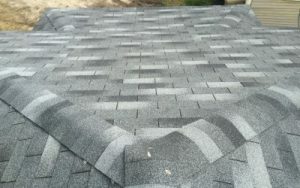 Asphalt shingles are known to blow off in high winds, or scar easily if your climate is extremely hot. All in all, this is a great option, especially if you are going for a clean look. If you want your home to stand out and exude elegance, clay tile could be a great choice. With the options of flat, ribbed, or scalloped, clay tiles have a unique appearance and require very low maintenance. Some of the biggest benefits include: a long lifespan, completely flame retardant, and very energy efficient. Some of the downfalls of clay tile, though, can outweigh the benefits. Some of the biggest aspects to consider are: very expensive, larger weight which requires extra support, and they are more fragile and can be broken relatively easily. Regardless of the material you choose for the roof of your home, A&H Forensic Roofing is here to install it for you! Our roofing contractors are experienced with a multitude of materials, so you never have to be the trial run. We pride ourselves on building trustworthy relationships with our clients, starting with a finished project. At A&H, your success is our success. Call today to schedule a free roof inspection.